Founded in 2001, we are a four-part chorus with over 40 members of various ages and Jewish affiliations. Our repertoire is inspired by the richness and diversity of Jewish music from around the globe, ranging from moving liturgical pieces to contemporary compositions and updated arrangements of world folk music in many languages. The chorus meets for rehearsals September through June on Tuesdays from 7:30-9:30 PM at the Park Slope Jewish Center on the corner of 8th Avenue and 14th Street in Brooklyn. Contact us at ShirChadashBJCC@gmail.com. 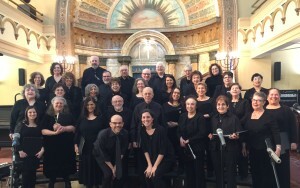 ANNOUNCING AUDITIONS FOR THE FALL SEASON Shir Chadash: Brooklyn Jewish Community Chorus If you have a passion for Jewish music and are committed to the highest quality of performance, we encourage you to visit us and audition. All voice parts welcomed. To audition, please join us at one of our rehearsals, held Tuesdays, 7:30 pm, at Park Slope Jewish Center. Fall season rehearsals resume on Tuesday, September 4, 2018. Sunday, January 27, 2019 at 7:00 p.m.